Forgive a belated post. I spent the last five days in Atlantic City, New Jersey, with a team of nine that did restoration work in a community ravaged by Hurricane Sandy. Three teams worked in three different homes, and one church. The before-and-after images of the homes two of the teams spackled, sanded and painted had to bring unexpected delight to the folks whose living spaces were invaded by the storm’s violence. 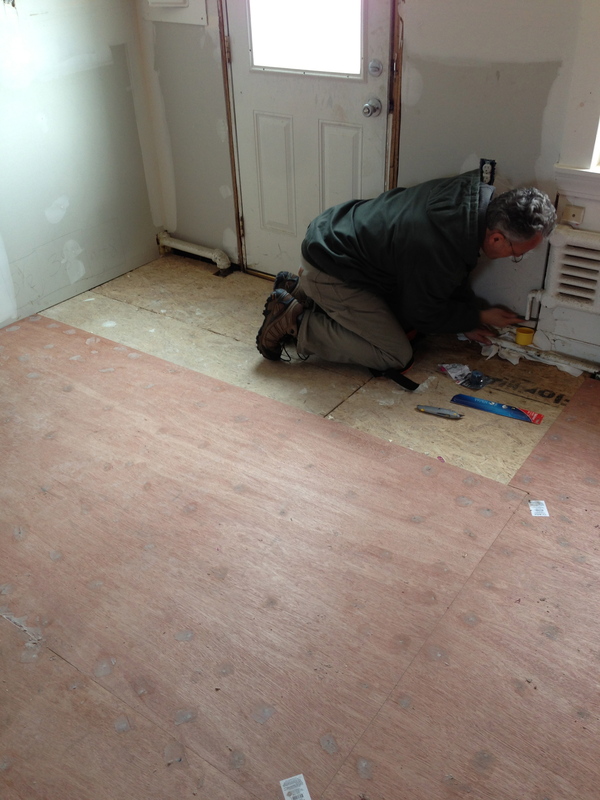 The team I served on laid a kitchen floor after stopping a radiator leak, first by constructing a sub-floor. The project involved a healthy chunk of time measuring and re-measuring every contour of the floor’s layout, then in cutting large blanks of thin plywood (sub-floor), gluing, driving screws, rolling, and then gluing again in order to situate the new floor into place. For us novices, this installation was a two-and-a-half day project. Those who spackled, sanded and painted would say the same. Paid professionals would knock this stuff out in no time. We were doing our part. It will be years before Jersey and other affected states are able to finally put the storm behind them. More remains to be done than has already been accomplished. This is the way of such devastation. But it is also the way of healing. As we debriefed one evening, it occurred to us that this is the way the Gospel enters, in the way Jesus would simply enter into a town or village, and brings flourishing into brokenness, at every level – a heart, a life, a home, even a community. You can break it down further: Injured marriages, failing cities, broken relationships and damaged memories all heal in the same way. Even if one could point to a moment, it is rare that everything happened in a particular instance. No, it is normally after many dynamics converge into a quantifiable point in time. This after brokenness was unearthed, damage was acknowledged, and deep need and despair were felt. The sub-floor of brokenness. When we enter into a broken community, or start a new church, or encourage a hurting neighbor, we do what the gospel does – we come to them, not to fix (because we can’t), but to enter into a greater narrative in God’s work of healing the whole world. Last week, in the process we met friends we may never again see until the Feast. But for them, and for us, the gospel had come in a fresh and beautiful way – to all of us, just as it always does – with salvation and healing, hope and renewal. It comes to a world that will remain unfinished, a world populated with people equally incomplete – until Jesus finishes what He has inaugurated – until He satisfies every yearning, heals every neighborhood and reconciles every broken part of His good creation. You are currently reading Floored by the Gospel at unfinished1.